Does your sock drawer look like a disaster? Organize it the KonMari way and never have to hunt for a matching pair again! 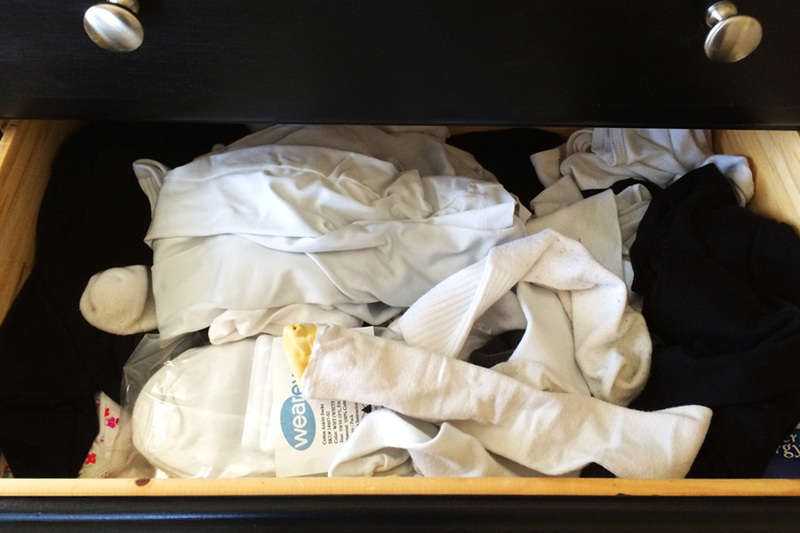 Is your sock drawer a disaster? Are you super annoyed when you can’t find matching socks? Do you accidentally run out of underwear because you can’t see how many pairs you have left? Let’s declutter and organize our “unmentionables.” Except for socks. You can mention socks. And pajamas. The things I mean by “unmentionables” are bras, underwear, and intimate wear. When storing socks, the most important thing to remember is not to stretch the elastic! This means no stuffing your socks inside one another and making little potato-like balls to roll around in your drawer. It also means no folding the top of one sock down over another. We greatly shorten the lives of our socks by keeping the elastic in a constant state of tension. In The Life-Changing Magic of Tidying Up, Mari Kondo suggest folding our socks. I know it sounds weird, but it totally works. Find a pair of socks and lay one on top of the other. Then just fold the pair in half and in half again (or thirds, depending on the length of your socks). Then stand them on end, just like you did your shirts and your pants. The perfect thing to do is to arrange your socks in a shoe box that fits inside your drawer. That will keep them all together. (Go to the next page to see a picture demonstrating how to organize your socks). Click “next” to learn how to fold nylons, underwear, intimates, and pajamas. I was just reading a little bit of your inspiration about the Challenge and wondered if I can start at the beginning? I would love to take them one week at a time. What I have seen is just amazing and very inspirational!! !